Despite growing up in a Chinese family (granted, a Chinese family in the midwest of the USA), until last week, I was never exposed to real Sichuan food. 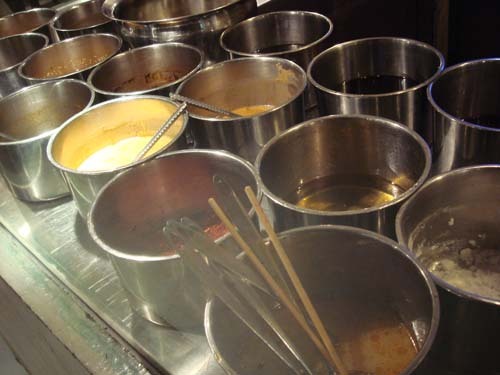 Sure, sure, I had sampled many of the restaraunts in various cities in the US, but typically the cuisine was Cantonese, Shanghainese, Taiwanese or at best Hunan. Eating real Sichuan food in China (yes, I was back there again!) was a bit of an experience. Soo…above was a chicken dish I had. Well, chicken is sort of applied in the loosest of ways. It’s more like chicken hidden in a sea of red peppers. You sort of pick your way through it, looking for morsels of chicken, and the bolder ones of course just eat it all. But that wasn’t the most interesting thing. Above is the real Ma Poa Tofu. It looks innocuous enough, but to my surprise, there is a spice I have never had before. My hosts couldn’t translate the English name to me, but it turns out to be, according to Wikipedia, the Sichuan Pepper. That’s it up there. In Chinese, the word for “spicy hot” is la. The word to describe the effect of the spice pictured above in Chinese is ma–and that’s the “Ma” in Ma Poa Tofu that I had been missing all my life (nice how ma and la rhyme, huh? makes for some poetic sounding dinner conversation and cheeky sayings about the Sichuanese in Mandarin). Many of us are familiar with the la sensation–that burning, five-alarm sensation in your mouth. Ma is something else. Your lips tingle and numb. Your mouth tingles. As you swallow it, your stomach feels strangely warm and tingly all over. It’s definitely spicey, but it’s not hot…it’s…ma. I think the ma sensation fights the hot-spicey sensation so you can eat more of it. Or something like that. But everything they say about how hot Sichuan food is, is true. And anecdotally, just as addicting. My friend was telling me that his friend’s girlfriend is from Sichuan, and apparently if she doesn’t eat at least one scorchingly hot meal a day, she gets extremely irritable and very aggressive. I’m wondering how in all my years eating Chinese in the US, I have never come across this spice. The Wikipedia page notes briefly that the FDA banned it from 1968 to 2005, which may have something to do with it. You learn something new every day. Speaking of learning new things, did I ever mention that the Irish slang for an unstable object is “wonky” (for example, a table with uneven legs is a wonky table)? I learned that too on this trip, from a joke this Irish girl told me at a pub: Q: What do you call a three-legged Donkey? A: A Wonkey. Q: What do you call a three-legged donkey with one eye? A: A winkey-wonky…I tell you, Shenzhen is growing up to be a rather international place! And another factoid for you: there are seven women for every man in Shenzhen. I have no idea how true this is–my host asserted this to me–but it seems consistent with the ratios I’ve seen in every factory, office, store, and pub in that city. This entry was posted on Wednesday, January 31st, 2007 at 2:27 am and is filed under Made in China, Ponderings. You can follow any responses to this entry through the RSS 2.0 feed. Both comments and pings are currently closed. My girlfriend surprised me once with that pepper (she calls it flower pepper). I sat down to dinner, started eating and suddenly my mouth started tingling. She got quite a kick out of waiting for my reaction. Definitely a unique sensation but I’ve grown to like it. hey, nice essay. 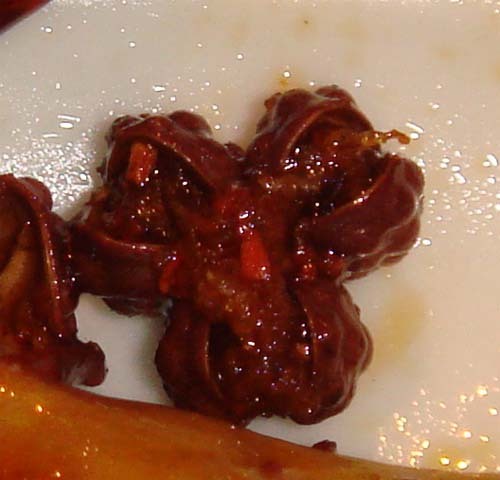 you may need some seeds of Zanthoxylum, and plant it in your back yard, but pls take care of your dog, it can be his meal. Bunny, please keep writing this stuff! The combination of chinese manufacturing diary and random food observations is excellent. 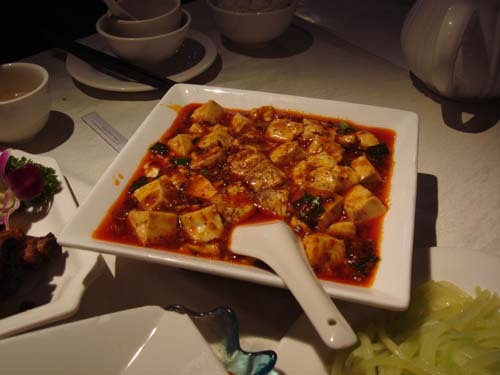 I was very surprised to see this bit on ma po tofu, a dish I dearly love. I’m over in Japan, and the spice you are talking about I am familiar with from eating various spicy japanese dishes. I had never tasted it before moving here, but I never knew it was Chinese! I mean, growing up in the bay area with chinese food all around me, and yet it never made an appearance. I can relate to this post… Jess and I bought some Sichuan pepper a while back – I think it was from Christina’s spice shop in Cambridge, near the East Coast Grill. I used it in a stir-fry dish. I thought “Chinese spice, should go well in stir fry, right?”. As you might expect, being a Westerner, I am not fully familiar with the distinctions between the cuisines of China… as such, this might have been the culinary faux-pas equivalent of putting olive oil on a Normand dish, or ketchup on French fries in France, and if so, I apologize to all Chinese culinary experts here…. 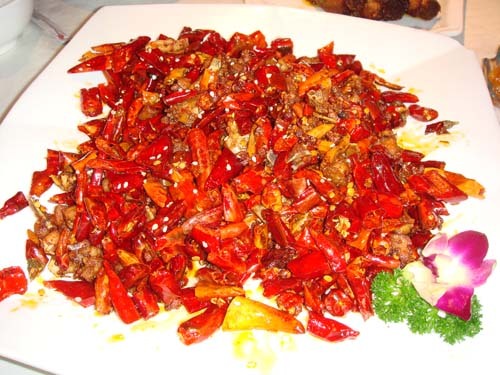 Anyway, I expected the Sichuan pepper to be just another hot pepper with a slightly different flavor (such as pequin or tepin peppers). Boy was I wrong. It had an odd spicy-but-sour feel to it. It was interesting, somewhat pleasant, but next time I’ll refrain from putting too much, because its flavor is strong and will easily take over the whole meal. I can’t add your rss feed to my reader, what could be the problem? Beautifully done blog, glad to see you’re still at it, too. Referring to your 2011 posts. I like this one in particular. Good post.